"We haven`t been paid for three months." Under the model, fans pledge money to a band for a particular purpose - for instance, making a new album - and when the project is completed the musicians get the funds. Thanks to Pledge, there is now a new Jesus Jones album - Voyages - ready for release. 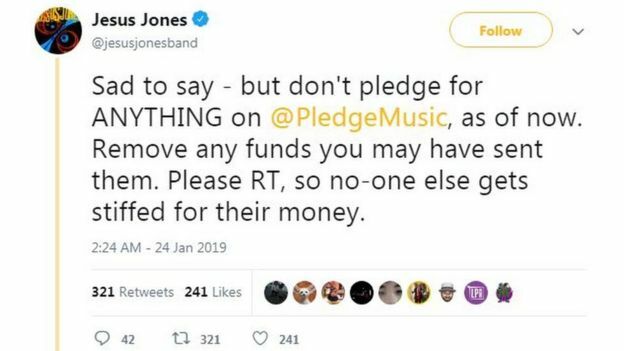 "I spoke to Pledge and was told payment was pending, which turns out not to be entirely true," Iain Baker, the band`s keyboard player, told. "Sad to say - but don`t pledge anything on PledgeMusic. Remove any funds you may have sent them." He told that "That tweet has gone viral, it is probably the most viral we have been." "We acknowledge that many artists have and continue to experience payment delays. These delays to artists are unacceptable - not only to them but to us. "While the company has made progress, we still haven`t reached our goals. PledgeMusic has been in discussions with several strategic players in the industry who have an interest in the PledgeMusic platform. Since launch a decade ago, PledgeMusic has served more than 45,000 artists from emerging acts to some of the bigger names in the industry, including U2, Erasure, Rod Stewart, The Dandy Warhols, Razorlight, and The Killers` Dave Keuning. Mr Baker is not convinced by Pledge`s explanation: "Reading between the lines it seems to say that they are up for sale and they hope someone buys them, and if they agree to take on our debt, you will get your money." "We do what we do as a hobby, we get back together a few times a year and this won`t force us into destitution, but there are other bands on the platform that don`t have other incomes, for whom this money is crucial," he said. "I`ve heard that people have been on the phone to Pledge, crying. Parents ringing up and saying `this is my son`s livelihood`." "We started off as buskers and we`d follow much bigger bands, and busk to their fans. At one point, we followed an American group through their whole tour and ended up on stage, playing three numbers," lead singer Richie Prynne told. "It revolutionised the way that music got out. You don`t have to rely on a huge corporate monster. Anyone I have ever dealt with was super passionate about music. They were with us every step of the way." "I don`t know what has happened but it seems like some serious mistakes have been made and Pledge hasn`t controlled its finances well," he said. "I`m hopeful we will get the money back. It is not just my money, it is every musician in the band`s money and the fans` money."